When Patrick had his tonsils out we knew he’d be on soft foods for weeks and that he’d probably get sick or starve to death trying to eat popsicles and fro-yo the whole time! 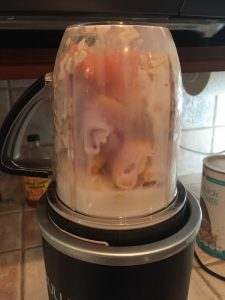 So, my mom and stepdad were kind enough to loan us their NutriBullet Rx and I began looking up Smoothie Recipes that would be good meal replacements. 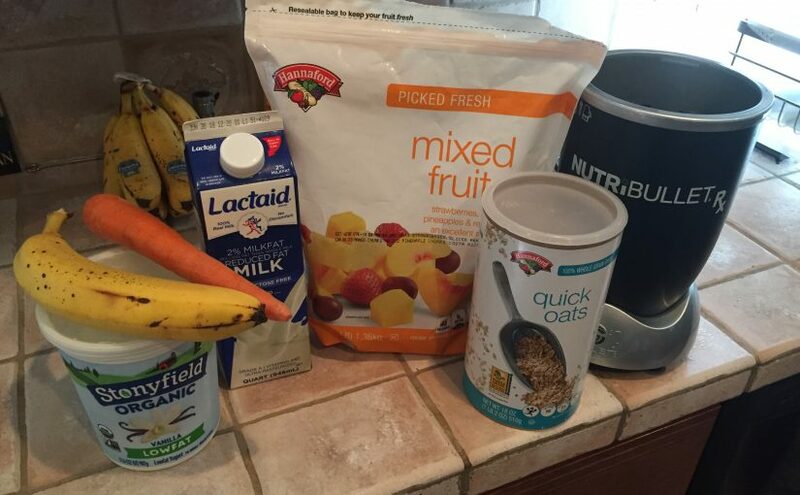 Leading up to his surgery we started using the NutriBullet Rx and testing things out. Almost immediately we realized this was a huge game changer in a house with budgies, and would help us stop wasting a lot of fruits and vegetables. Virtually every week I buy a bunch of carrots with tops so that the birds can have their preferred type of bath. But the thing is, I don’t want to eat carrots every week. They aren’t my favorite snack and they don’t always fit into our dinners. Same thing goes for bunches of celery, as well as most fruits and vegetables that I buy for the parakeets. If I buy a pint of strawberries and they eat two, I better figure out what to do with the rest of them! I realize that this may not be an issue in larger households where there are healthy lunches and after school snacks being made for little ones. But, in a two adult situation it’s just too much produce to choke down every week. Enter the NutriBullet Rx . Now for weekend breakfasts everything that didn’t go in a budgie’s crop goes into the blender. We keep some frozen fruit and oatmeal on hand to pad it out and I always have greek yogurt in the refrigerator. It’s a great way to stop throwing out money on produce and Patrick and I are having healthy breakfasts on the weekend instead of starting the day with carbs. 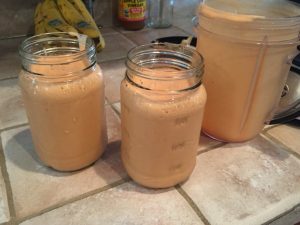 I know, I am years behind on discovering how great smoothies are! 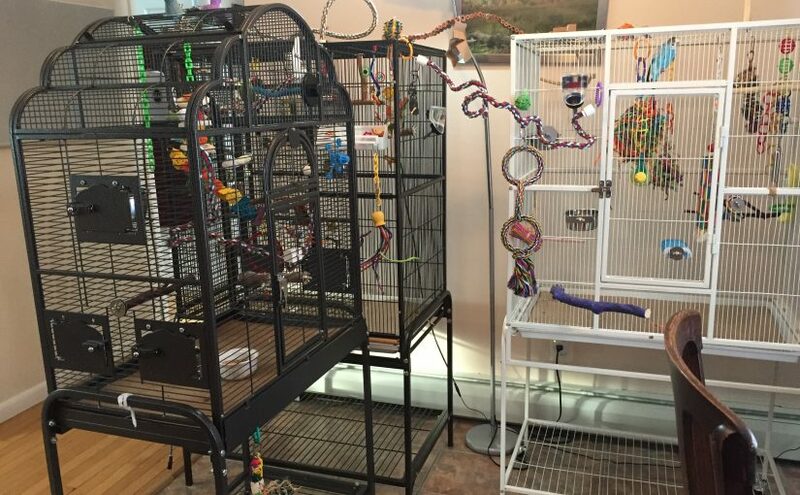 But, I think they are even more awesome to help manage the extra produce you have when you’re trying to get your budgies to eat some fresh fruits and vegetables and don’t particularly feel like eating crudité every day. 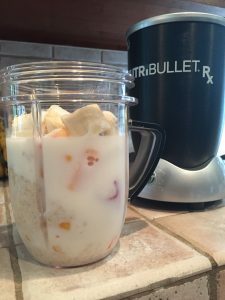 As far as the NutriBullet Rx review, it is extremely easy to use and clean up after. 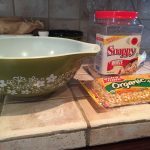 Fill the cup to the max line with your preferred combination of fruits, veggies, liquids and fillers like oatmeal, then just turn it over and place it on the base. The blender automatically starts working and stops after a preset amount of time. No timing or thinking involved there! When it stops you remove the cup from the base, unscrew the cap (which has the blades) and rinse in the sink. Pour out your smoothies and voila, you have two perfect cups of goodness! I can’t imagine the NutriBullet Rx being any easier to use than it is. And, Kelly enjoyed the carrot stump that didn’t go into the mix! I am all about feeding the parakeets new and interesting foods, although of course only parakeet-safe stuff. 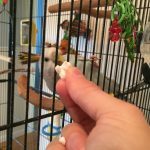 There aren’t too many human snacks that we can share with our parakeets, but popcorn is on the approved list. The only caveat is that it can’t be the salty, buttery awesomeness like you get at the movie theater or from a bag of microwaved popcorn. Plain old popcorn is the ticket. 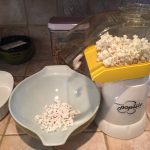 We’ve had a Presto Hot Air Corn Popper for years – it’s the same brand that I grew up with and it’s so easy to use. You put the corn kernels into the well, plug it in and wait until they pop. It’s a bit noisy as the air heats the kernels but in a few minutes it’s all over and you have a beautiful bowl of pristine popcorn. Our favorite kernels are Snappy White Popcorn and we have some on hand at all times. The best thing about the air popper is that you don’t have to worry about burning oil on the stove top or washing a greasy pan afterwards. It’s a great way to make a healthy snack for humans or parakeets. Because of my concerns about the noise, I hadn’t made popcorn literally in the two years since we got Toby. Pretty silly, right? 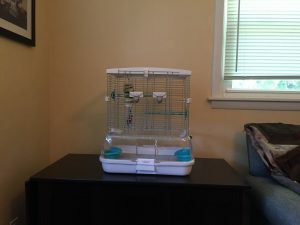 We recently decided to try it out and see how traumatized the parakeets would be – which was, as it turns out, zero traumatized. Although that didn’t mean they quite knew what to do with the popcorn once it was popped. Kelly enjoyed ripping a few pieces apart while Patrick held them, but once they were on a little plate in her cage she totally lost interest. Toby was very suspicious of the end product and didn’t even venture to lick a piece of popcorn. No worries though, parakeets are notoriously reluctant to try new things so I’m not really put off. Now that we know they aren’t scared of the noisy Air Popper there will be a lot more popcorn opportunities in our house. So, we will offer them a little bit each time and see if the idea catches on; if not, at least it’s something unusual for them to think about, which is always an enriching experience. 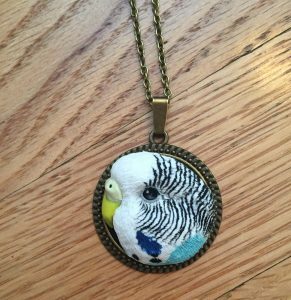 A very budgie Christmas – budgie gifts are the best! The holidays can be a relatively hectic time of year, it’s always fun, but there are lots of folks to visit and celebrate with. Patrick and I decided a few years back that we would pick a day after Christmas and use that as our Christmas Day for our own traditions and gift exchange. That way we wouldn’t miss out on any of the extended family fun, but we could still have a day that felt special to us. 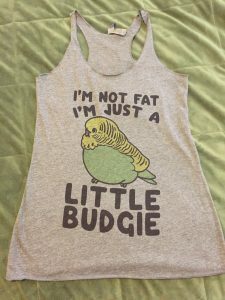 He really knocked it out of the park this year and I received a number of awesome budgie gifts! We also don’t buy a traditional Christmas tree, both for parakeet and human-based reasons. 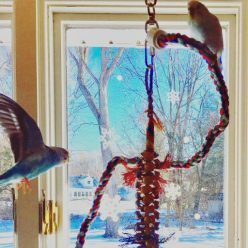 With the parakeets I worry that buying a non-organic tree could put them at risk of ingesting pesticides and other chemicals if they landed on the tree. As far as fake trees go, I would fret about them chewing on the needles and eating plastic. I’ve never pretended to be blasé about life, so this tree-related angst probably comes as no surprise to anyone! 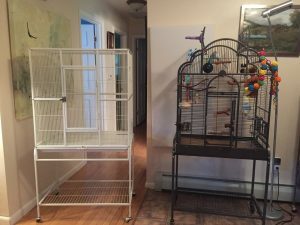 In addition to my parakeet/tree issues, my husband also has a bunch of allergies and chemical sensitivities that make either kind of tree a challenge to his well being. So, several years ago we ditched the concept of traditional trees and have either used a Java Tree for the birds with holiday-themed ornaments, or Patrick builds a tree out of cardboard and it’s a temporary affair. 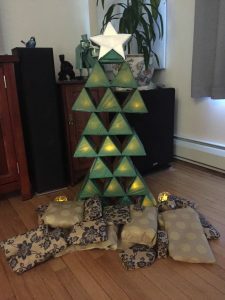 This year was a build year – he used cardboard, tissue paper, tiny fake tea light candles and here’s the result. It is very beautiful with the lights flickering, there’s even one in the star. And the birds totally ignore it because it’s relatively short and not in one of their flight paths. 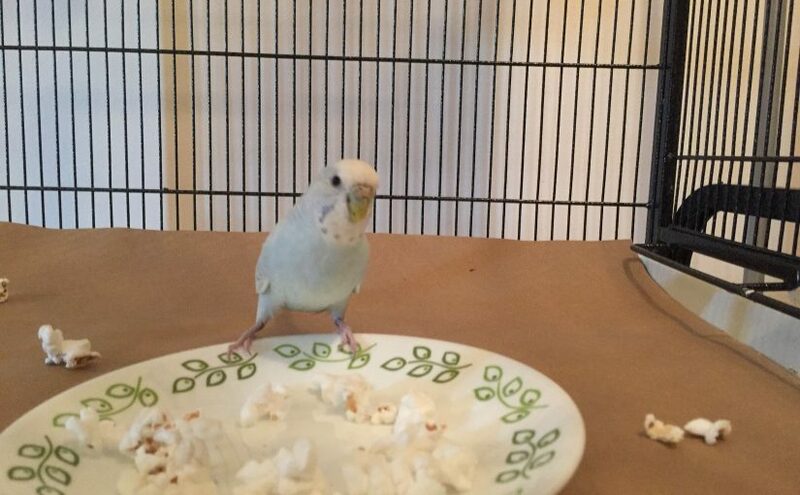 On to the budgie gifts! 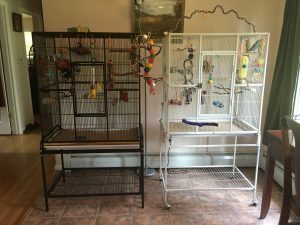 It’s probably poor form to “brag” about the things I got for Christmas, but I feel like other parakeet lovers will want to know these things exist! This tank is the cutest thing! It would be a great workout tank or just lounging around the house in summer. Patrick wanted to find one with a parakeet that looked like Kelly, since she’s our big girl, but she’s not a very common color. 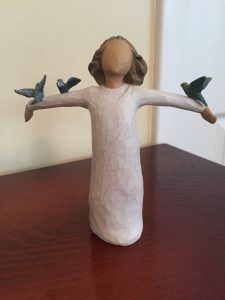 Usually I’m not a huge fan of these figurines, but it’s a girl with three birds! So cute! Patrick even took some crayons and colored the birds to resemble Toby, Kelly and Kevin. I mean, come on, how sweet is that? The real star of the Christmas show, however, was this custom necklace he had made to look like Toby. It looks exactly like her! Down to the expression in her eyes. Patrick said he provided the shop owner with three pictures of Toby to start and then they refined from a proof after that. The shop owner was incredibly responsive and polite, even when he made multiple changes and asked that she rush the order for Christmas delivery. The shop name on Etsy is NicomadeMe and based on Patrick’s experience and the finished product I wouldn’t hesitate to recommend her! It’s not often that a gift makes me teary-eyed, but this one did that quite spectacularly. 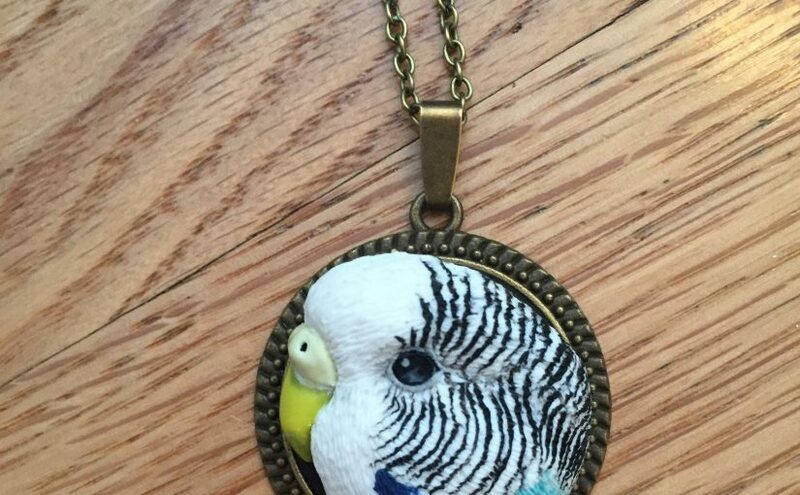 Did you receive any fabulous budgie-related gifts this holiday season? Let me know so I can build by wish list for next year! I hope everyone had a safe and warm holiday full of love and feathers – happy new year all! 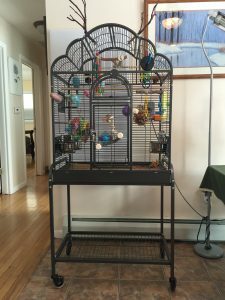 Posted on January 2, 2018 December 29, 2017 Categories Products and ReviewsTags budgie gifts, budgie products, holidays4 Comments on A very budgie Christmas – budgie gifts are the best! 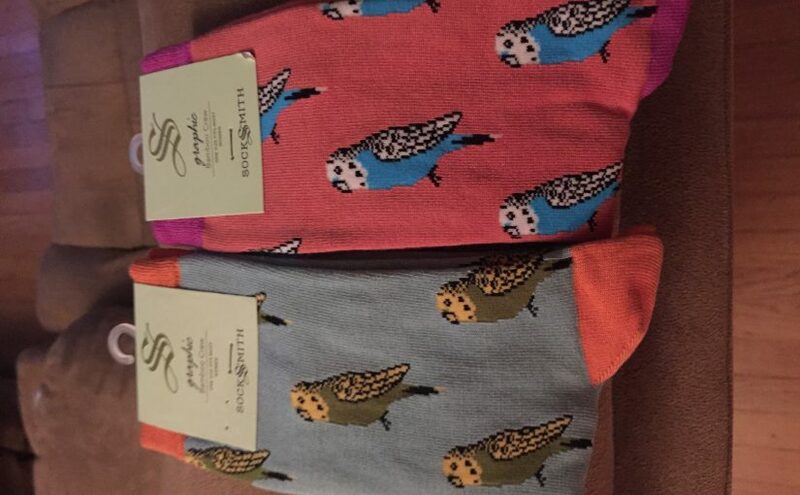 The best socks ever – not surprisingly, budgie socks! I don’t make a habit of going around looking for products with budgies on them. 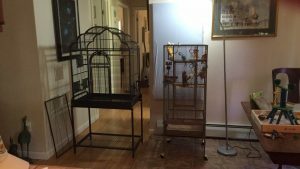 If I did, my whole house would be an homage to budgies and other parrots and packed to the gills with artwork and knickknacks! But, I did see something recently that fell into the “have-to-have” category and seemed justifiable in it’s utility. The item in question was a pair of socks with budgies on them, and being winter, everyone needs new budgie socks, right? 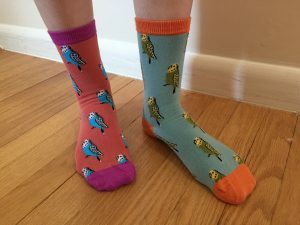 The Socksmith Women’s crew socks “budgies” come in two colors, blue and pink, one with a blue budgie and one with green, so if you’ve got one of the more standard color budgies there’s a pair for you! I purchased both pairs because why not. I should perhaps mention that I have a pre-existing penchant for purchasing novelty socks which may have influenced my impulse spending. I anxiously awaited the arrival of my new socks and eagerly ripped open the package as soon as they hit my doorstep. I was very pleased with their feel, made of 68% bamboo they were very soft before even washing. I always wash new clothing before wearing, so I threw them in the laundry and kept my fingers crossed that they wouldn’t fall apart immediately. One never can be certain of quality with a novelty sock purchase. Happily they made it through and came out even softer on the other side. I washed on delicate and then tumbled dry with low heat. 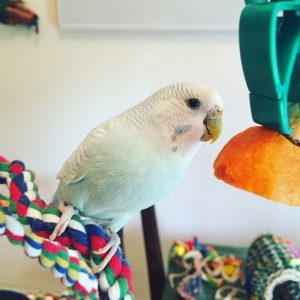 There’s probably not much call to talk about laundry products on a budgie blog, but since all of the humans and birds in my house are sensitive to fragranced products, we use Seventh Generation Natural Laundry Detergent Free & Clear – 50 Fl oz , and add White Vinegar as a fabric softener. 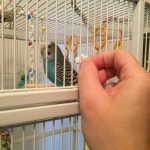 Since we are totally unscented and trying to avoid chemicals for both the human and budgie inhabitants we use Wool Dryer Balls to help with static cling in the dryer. Sorry for the tangent! I get kind of preachy about scented laundry products because it’s one area that a lot of people don’t think of where they are adding unnecessary fragrance to their lives every day. With increasing numbers of people walking around with chemical sensitivity it’s incumbent on all of us to think about what we’re putting out into everyone’s airspace. Now I’m sorry for that tangent! Back to the cute budgie socks! I did not actually mix and match my budgie socks but they do look sort of cute together, so no judgement if you go for it! Posted on December 26, 2017 December 3, 2017 Categories Products and ReviewsTags fun, review4 Comments on The best socks ever – not surprisingly, budgie socks!